May 26, 1993, LG Crabo. Antherea polyphemus is one of our moth giants (FW length 44–68 mm; wingspan 9.9–16.5 cm). The wings are broad, and the apex of the forewing is broadly falcate. Both wings are buckskin-brown, occasionally olive to reddish brown, with salt-and-pepper light and dark scales near the costal margin of the forewing and slightl gray suffusion in the postmedial area. The antemedial line has white inner and red-brown outer components, is nearly perpendicular to the trailing margin except for a step-off at the lower cell. The postmedial line is diffuse warm brown, perpendicular to both margins with a gently curve through the cell. The subterminal line is gray followed by light gray, smoothly concave toward the lateral margin. It is preceded by black spots near the apex. The hindwing antemedial line is white at the base of a large black mark that surrounds the discal spot. The subterminal line is black followed by light gray, diffuse. The discal spots of both wingss are outlined in black and yellow with clear centers. That on the hindwing is surrounded dramatically by jet black and preceded by powdery blue scales. The thorax and abdomen match the forewing, with a gray collar. The antennae are quadripectinate, very broad in the male. 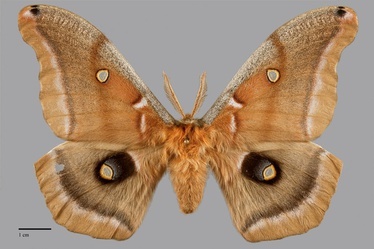 The Polyphemus moth is unlikely to be confused with other moths due to the combination of very large size, tan dorsal color, and clear eyespots. 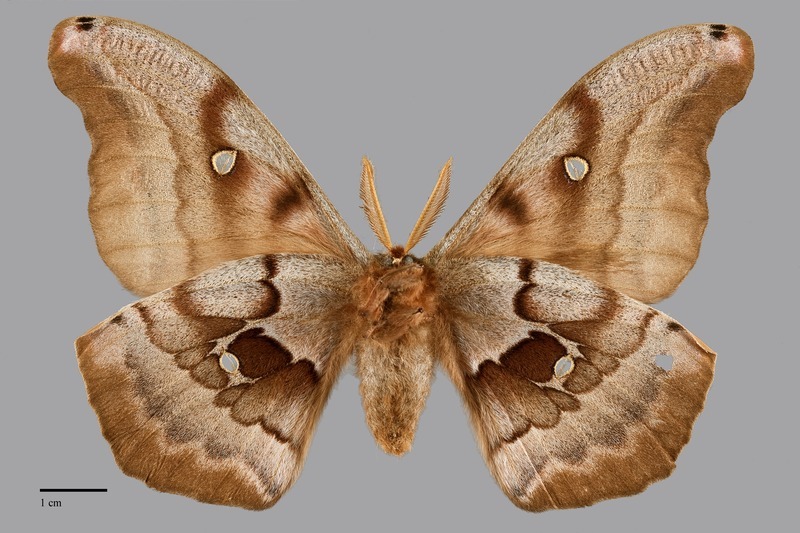 Our only other giant silkworm moths of similar size and shape are darker red-brown and lack clear eyespots. The larve has a large bright green body, with the base of the setae red in coloration. The head and true legs are brown. The prolegs have yellow coloration with black tips. It is illustrated by Miller and Hammond (2003). This species is common and widely distributed in wet forested areas, woodlands, deciduous hardwood forests, orchards, and wetlands throughout the Pacific Northwest at low to middle elevations. It readily adapts to urbanized areas as well as suburban gardens. Large population explosions sometimes occur in commercial hazelnut orchards in western Oregon. 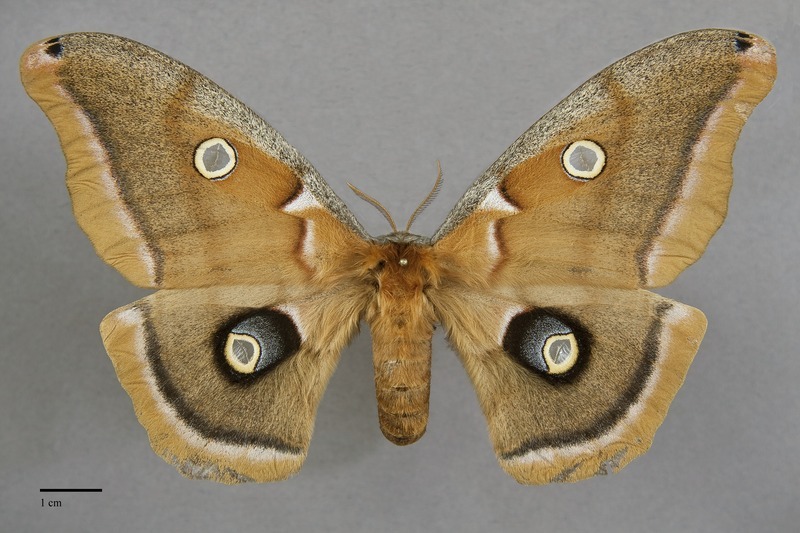 Antheraea polyphemus is widely distributed throughout the Pacific Northwest, extending north to northeastern British Columbia. It is only absent from dry steppe in the interior of our region, such as much of southern Oregon and Idaho and the Columbia Plateau ecoregion. This moth is found throughout much of North America. It is found in all Canadian provinces except Newfoundland and throughout most of the continental United States. The distribution is patchy in the West. Outside of the Pacific Northwest it occurs in most of California, and also in the central Rocky Mountains in Utah, Colorado, and northern New Mexico. It is replaced by the similar species Antherea oculea in southern Arizona and adjacent New Mexico. The eggs are layed singly or in groups of 2 or 3 on leaves of the host plant. This species is a generalist hardwood feeder on many species of trees and shrubs, and particularly favors Aceraceae, Rosaceae, Salicaceae, Betulaceae, and Fagaceae. In western Oregon, larvae are most commonly found on big-leaf maple (Acer macrophyllum) or Oregon white oak (Quercus garryana). Cocoons are made of silk and hang from twigs over the course of the winter. 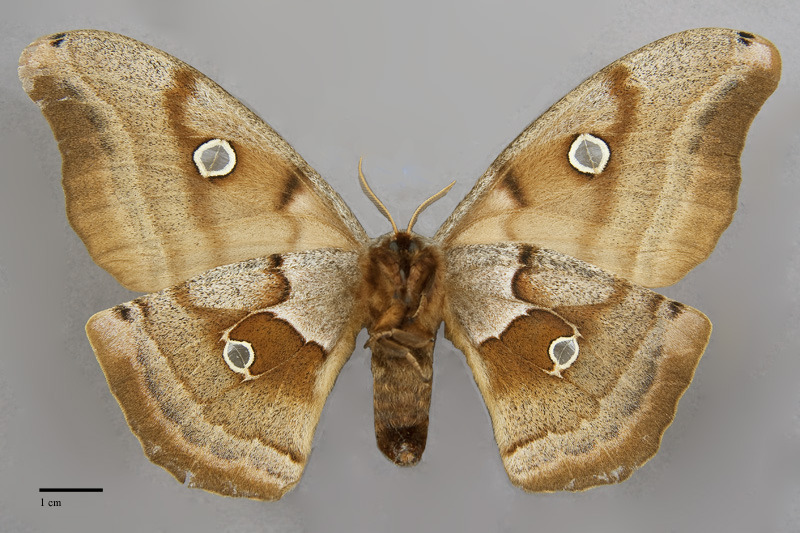 Antheraea polyphemus is nocturnal and comes readily to light. This species is often found at porch lights that have been left on overnight—such finds often produce awe and wonder in those who discover them! The adults rest with the wings held together over the back like most butterflies, showing the darker brown patches and flowing pattern of the underside. Our populations are most likely single-brooded with capture dates from mid-April until August. Second-brooded populations exist in areas with warmer climates. Like other giant silkworm moths in the family Saturniidae the adults do not feed. This species is generally of no economic importance, although larvae can become occasional pests in plum orchards of California or hazelnut orchards in western Oregon.